Textron‘s (NYSE: TXT) Beechcraft subsidiary has landed a one-year, $88.2 million “undefinitized” contract with the U.S. Air Force to build trainer aircraft and provide maintenance support and pilot training services for Argentina’s air force as part of a foreign military sales deal. 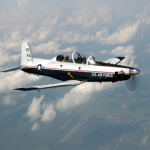 The Defense Department said Tuesday Beechcraft will deliver four T-6C+ trainers along with supplies and services to support a training aircraft replacement effort as well as surveillance and border security missions of the Argentinian air force. Argentina intends to procure 24 T-6C+ units and support services from the U.S. government under a $300 million FMS agreement the State Department approved last year. 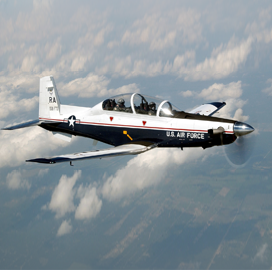 Beechcraft’s T-6C system is designed to help military pilots prepare for real-world missions and consists of training courseware, media-integrated lectures and computer-based training and management systems. Work under the sole-source contract will occur in Wichita, Kansas, through April 30, 2018. The Air Force Life Cycle Management Center in Ohio is the contracting activity.